Discover the unique landscape of Lanzarote, and enjoy some winter sun, based in Costa Teguise. The island offers some spectacularly scenic walking along rugged coastlines and beaches, through white-washed villages and lunar landscapes with dramatic volcanic scenery. Our trip starts in Costa Teguise, a coastal resort town on the east of the island, about fifteen minutes' drive from Arrecife Airport. If you arrive early there is a good selection of cafes and restaurants to choose from or you may wish to relax on one of the town's five sandy beaches. The hub of the town is the lively Pueblo Marinero square, designed by local artist and architect Cesar Manrique, whose work can be found across the island. Manrique was instrumental in founding the legislation that prohibits any high rise development on the island. Within a short walking distance of our hotel is a choice of local restaurants and bars, and Bastian beach. Today we explore the south of the island, driving 40 minutes to Femes, a small village at the base of the southern mountains. Our walk takes us on a well-marked trail through the lunar, remote landscape of the Ajaches hills. Lanzarote is an island of volcanic origin with a long history of eruptions, the most significant being the Timanfaya eruptions throughout the 1730's and in 1824, which shaped the landscape we walk through. Arriving at the coast, we follow the coastal path to reach Playa Quemada. This small seaside village maintains its charm with secluded beaches, idyllic coves and a handful of restaurants offering freshly caught seafood. Today's 10 kilometre walk is expected to take approximately four hours with a total ascent of 350 metres and descent of 650 metres. Our walk today begins from Maguez village close to the north west coast. We follow the path along the top of the cliffs of Famara, first to the Montaña del Gayo with spectacular views across the Atlantic and surrounding cliffs and finally reach the Mirador del Rio. Mirador del Rio is a 475 metre high viewpoint located at the edge of the Famara cliffs, built into the larva rock. The building, designed by local artist Cesar Manrique, wonderfully blends into the landscape, the floor to ceiling glass windows and outdoor walkway enhance the panoramic views overlooking the Rio strait, between Lanzarote and the island of La Graciosa. In the afternoon we drive back Costa Teguise. Today's 14 kilometre walk is expected to take approximately four-and-a-half hours with a total ascent of 550 metres and descent of 350 metres. Today we drive to the centre of the island and walk through the volcanic scenery of Timanfaya - the most dramatic lunar landscape of black lava dotted with craters. Our walk starts close to Mancha Blanca village; we follow wide and narrow dirt paths surrounded by volcanic lava varying in both size and shape. At the end of the walk we drive to La Geria. La Geria is famed for its unique vineyards; the local farmers have devised an ingenious way to cultivate wine in this harsh environment, creating funnel shaped pits protected with low dry stone walls in which to grow Malvasia grapes. There are Bodegas (wineries) dotted along the road selling the honey coloured sweet wine, we will viist one. Today's 10 kilometre walk is expected to take approximately four-and-a-half hours with a total ascent and descent of 300 metres. Today has been left free to relax or explore the region more. It is possible to take day trip to La Graciosa - this small arid island has a population of less than 700, with unpaved sand roads, isolated beaches, a rich biodiversity of flora and fauna and a slow pace of life that makes you feel like you're stepping into a different country. On the island there is an enjoyable walk that takes you to Playa De las Conchas, and shorter or longer walk options can be discussed with your tour leader. The ferry to La Graciosa leaves from Orzola which is a 30 minute taxi ride from Costa Teguise. Another option today is to visit Jameos de Agua, designed by Cesar Manrique, Lanzarote's most influential architect. The venue has been built in the volcanic cave system formed by the eruptions of the Corona volcano; it features a swimming pool, restaurant and bar. 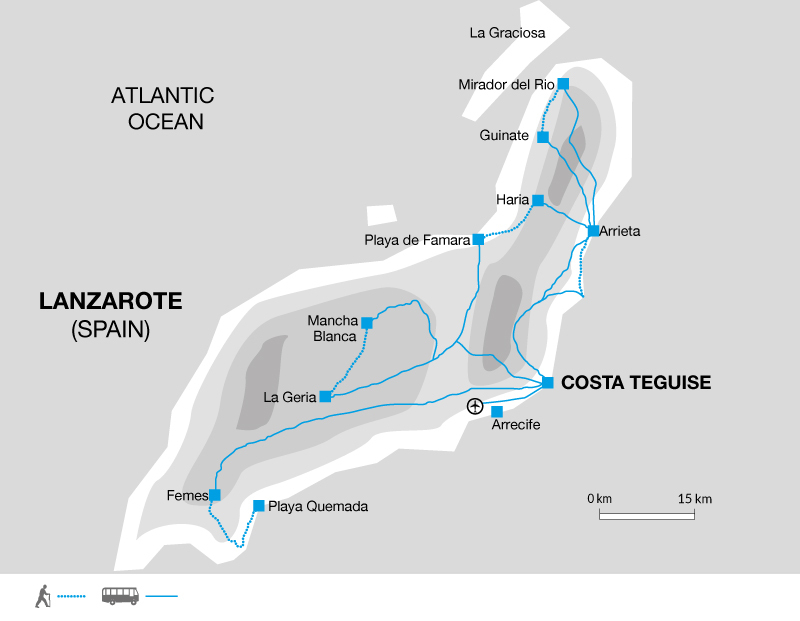 This could be combined with a visit to La Graciosa as it is located on the way or it is a 25 minute taxi ride from Costa Teguise. On the way back to our hotel there is the possibility to stop at Jardi\'acn de Cactus. This garden was also designed by César Manrique - built into an old quarry it showcases a collection of over, 1,000 cactus varieties. Today's optional 17 kilometre walk is expected to take approximately six hours with a total ascent and descent of 150 metres. This morning we begin our discovery of Lanzarote, driving north to Haria, a pretty village of low lying white-washed buildings situated in the fertile Valley of the Thousand Palm Trees. Walking across the surrounding hills we pass cultivated plots of fig trees and grape vines. Reaching the clifftop area of Bosquecillo there are numerous wooden benches where we can take a rest and soak in the views down the cliffs to Famara beach. The Famara Cliffs are an impressive sight, rising to over 500 metres high and stretching along the coast for 15 kilometres. Continuing, we make our descent down a rocky path to Famara beach to be rewarded with five kilometres of golden sand, backed by the dramatic cliffs and panoramic views across to La Graciosa island. Located between the fishing village of La Caleta de Famara and the base of the impressive cliffs, Famara beach is Lanzarote's surfing hotspot. In the afternoon we transfer back to hotel, stopping en route for a stroll through the lovely centre of Tequise, Lanzarote's old capital. Today's 12 kilometre walk is expected to take approximately four-and-a-half hours with a total ascent of 450 metres and descent of 650 metres. Today we drive from Costa Teguise to the outskirts of Guatiza where we start walking along trails leading to a quarry serrated into a volcanoe cráter and later down to the coast. We take the coastal path along the rugged coastline, passing some traditional salines that are still operating. This area is shaped by an ancient volcanic eruption in the vicinity, to the village of Arrieta, arriving in the early afternoon. There is time to explore this typical Canarian fishing community, relax on the golden sands of Playa de la Garita or take a swim in the ocean. 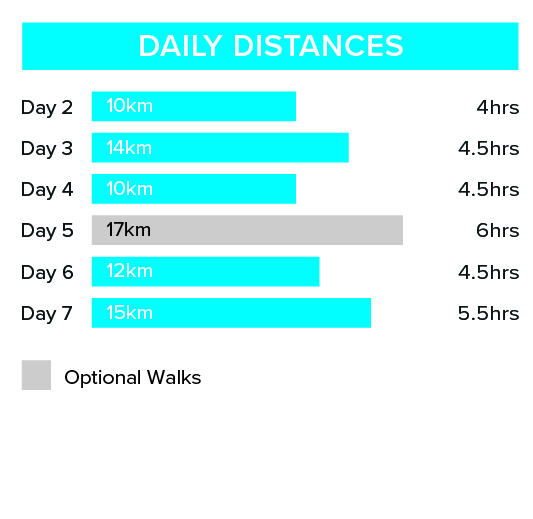 Today's 15 kilometre walk is expected to take approximately five-and-a-half hours with an ascent of 100 metres and and descent of 250 metres. Your trip ends this morning after breakfast, in Costa Teguise. La Graocias day trip: € 36 per person including return taxis from Costa Teguise and return ferry to the island. Jameos de Agua: entrance fee € 9.50 and a taxi (max 4 people) will cost approximately € 25 for the return journey form Costa Teguise. A good pair of broken in comfortable walking boots are essential. In addition to walking boots please take comfortable trainershoes or sandals for evenings / relaxing. We suggest that on international flights you either carry your walking boots in your hand luggage or wear them - should your luggage be lost or delayed, your own boots are the one thing that will be irreplaceable. Bring one main piece of luggage and a 20-30 litre day sack is recommended. You will need to carry what you need for the day which may include a raincoat, jumper, camera, sun-cream, picnic lunch etc. On hot days you will carry fewer clothes but more drinking water. Local Crew: Although entirely voluntary, tipping is a recognised part of life in this region of the world. Some local staff will look to members of the group for personal recognition of particular services provided. In order to make things easier for you, the Explore Leader may organise a group's tips kitty and if this is the case, they will account for it throughout the trip. Accordingly, you should allow approximately £15 for tipping. Our hotel is situated in a quite location on the edge of Costa Teguise town, restaurants, cafes and Bastian beach are a short walk away. Santa Rosa Apartments are modern and spacious; you'll be staying in one bedroom en-suite apartments, in whitewashed low storey villas. All apartments have their own fully equipped kitchenette, a furnished balcony or terrace and living, dining area. Both twin and single occupancy will have the same style of apartment. Set within the gardens is a large outdoor pool, bar and sun terrace, a welcome sight after a day of walking! Other facilities include a restaurant, indoor pool, fitness centre and tennis courts. Walks on 5 days for between 3.5 to 5.5 hours. The walks are on well-marked and maintained inland and coastal footpaths. On day 7, the terrain in Timanfaya National Park is rocky in places with little shade. The Canary Islands are a great destination for a winter escape to some warmth and sunshine. When looking at adding another island to our walking repertoire in the region, Lanzarote was the obvious choice. The island offers some spectacularly scenic walking not seen anywhere else from rugged coastlines, to white-washed villages and idyllic coves to lunar landscapes and dramatic volcanic scenery.